Structures of buildings were scarcely remained. We could find only traces of posts, so we have to reconstruct structures from the arrangement of posts. Two types of building structure can be distinguished. 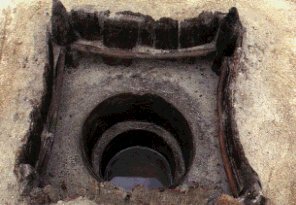 One is "post-hole type" whose superstructure was supported by pillars directly planted into the ground. The other is "base-stone type" whose superstructure was supported by pillars standing on base-stones. 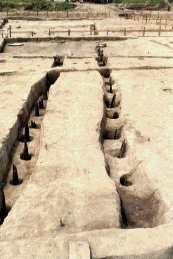 "Base-stone type" buildings remained were especially few, because the ground of the town had been leveled over and over, moreover many floods washed away the surface of the site. A lot of pits for garbage dumping were found in the site. The finds from those pits tell us what kinds of utensils were used and what kinds of food were eaten. It is noteworthy that a large amount of earthenware was discarded when garbage pits were buried. Since most of the earthenware did not retain the evidence of heavy use, it would be likely that the earthenware was used for rituals and discarded at once. Copyright © 1996-1998 Yasuyuki Suzuki & Hiroshima Prefectural Museum of History, Fukuyama, Japan. Last updated: June 10, 1998.